These seaside salt crystals are a beneficial blend of rich sea minerals, seaweed extract and natural essential oils that quickly renew the skin and body’s firmness. This formula has a dual purpose. When a tablespoon of salts are added to your bath, it will create a relaxing, purifying and detoxing mineral soak. Mineral baths reduce inflammation while helping in the replenishment of natural mineral content leaving your skin smooth and rejuvenated. When used in the shower, you can create your own in-home spa treatment called a “Salt Glow” to rub away impurities and leave the skin soft and smooth. For a truly purifying and detoxing experience, add the salt crystals to your favorite gel, lotion or oil. Rub onto your body in gentle sweeping motions. When your skin is receptive to salt rubs, you can apply the salts alone. For an extra special treatment, combine the salts with the Ayate Exfoliating Buffing Cloth for more intense exfoliating. 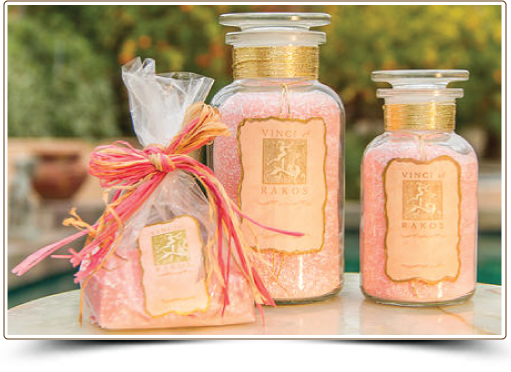 Whether using the Salts as a body rub or in the bath, follow with your favorite Vinci & Rakos Body & Massage Lotion, Oil or Cream, and your skin will feel soft and smooth. Favorite scents: Green Tea, Lavender Orange, Fresh Peach, Earth, Fragrance Free or choose the fragrance of your choice.